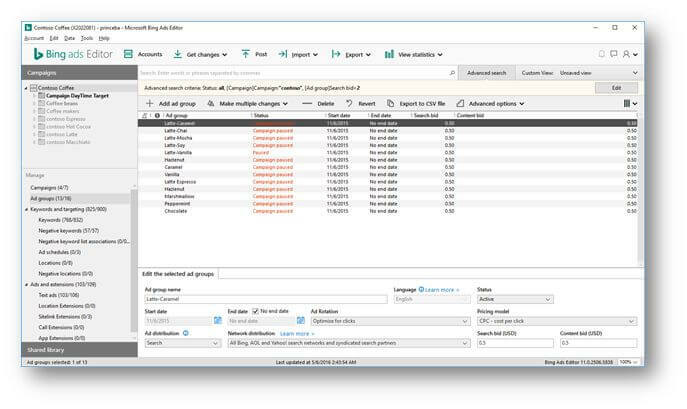 Bing Ads has rebuilt Bing Ads Editor in much the same vein as Google overhauled AdWords Editor 11 — but with some differences, including better advanced search. First, if you’re keen on the left-hand navigation set up in AdWords Editor, then you’ll be thrilled that BAE followed suit. For the rest of us, maybe version 12 will be our time. So moving on, here’s a rundown of some of the strong new features in BAE 11. 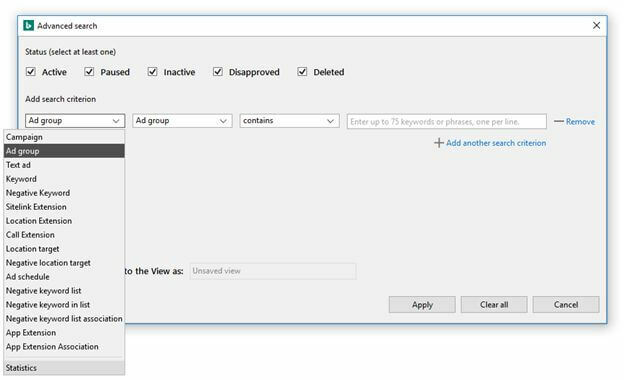 The biggest new functionality of Bing Ads Editor 11.0 is the ability to manage multiple accounts simultaneously. From the Account Manager window, you can add an unlimited number of accounts. Then, you can download multiple accounts and work in others at the same time. Like AWE, you can essentially have as many account windows open and active as you want. 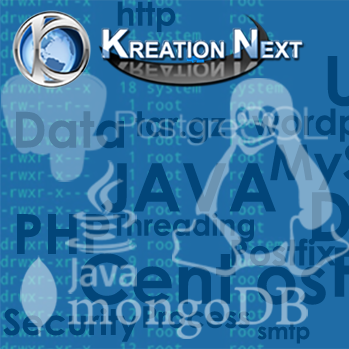 Multiple account management opens the door to new functionalities like the ability to cut and paste across accounts. BAE 11.0 features the same navigation layout as AWE 11 with campaigns, ad groups, keywords, extensions and targeting in a menu on the left instead of at the top of the main window. Where BAE stands apart from AWE is in advanced search. The new Advanced search window is much more streamlined than in the older versions of BAE, and it’s more intuitive and easier to build out layered search criteria than it was in AWE 11. One thing you’ll want to be sure to note is that options like Additional targeting, Exclude website and Append/Replace text no longer appear in blue links at the bottom of the Editor pane. They’re all now housed under a new Advanced options tab at the top of the Manager pane. And finally, there is no more confusing login! Now, you’ll just see a single username field when signing in. Whether you are using a Microsoft account or a Bing Ads username (because who wants to be bothered with remembering that? ), BAE will figure it out and direct you to the proper window to enter your password. Bing Ads Editor is now available for download. 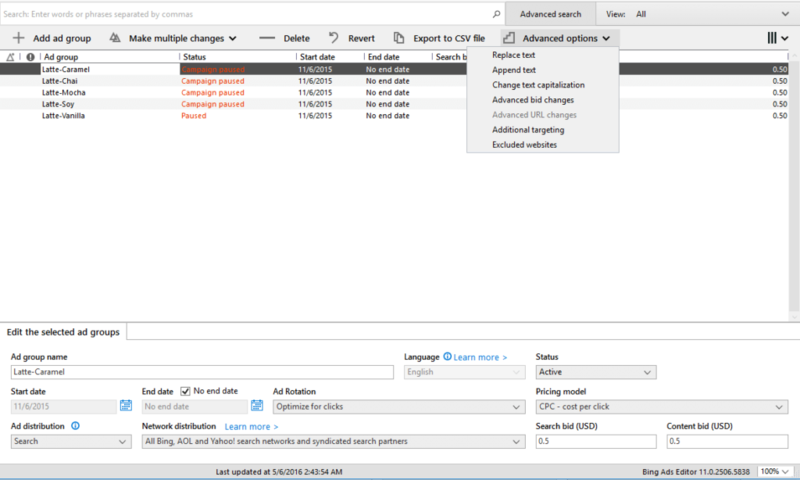 The old version of Bing Ads Editor won’t be uninstalled from your machine. 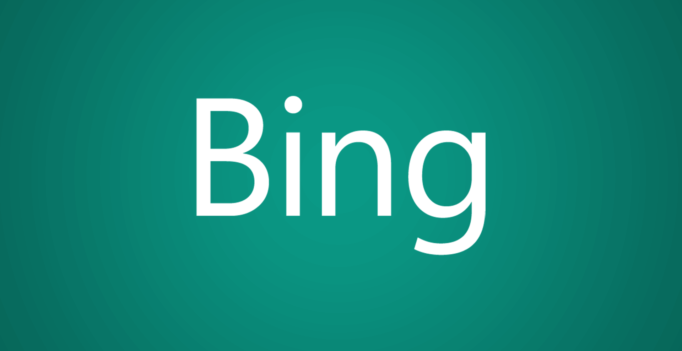 Bing Ads says older versions will continue to function for a few more months but will not be updated. The Mac version is still on deck for release this summer.